Rep. Luis Gutiérrez: Trump Wants to Own Puerto Rico But Not Help Those Dying After the Hurricane | Democracy Now! As President Trump threatens to withdraw federal relief workers from Puerto Rico, home to 3.5 million U.S. citizens, residents of the island and their supporters respond with outrage and disbelief. San Juan Mayor Carmen Yulín Cruz called Trump the “hater-in-chief.” We get response from Congressmember Luis Gutiérrez. AMY GOODMAN: President Trump threatened Thursday to withdraw federal relief workers from Puerto Rico, as his administration faces withering criticism on its response to the humanitarian crisis on the island, which is home to three-and-a-half million U.S. citizens. More than a month after Hurricane Irma hit Puerto Rico, and three weeks after Hurricane Maria, more than 80 percent of the island remains without power, and water is in short supply. In a series of tweets Thursday morning, Trump seemed to hold Puerto Rico responsible for its own plight, writing, quote, “'Puerto Rico survived the Hurricanes, now a financial crisis looms largely of their own making.' says Sharyl Attkisson.” Trump was quoting a reporter with Sinclair Broadcasting. He went on to write, “A total lack of..... …accountability say the Governor. Electric and all infrastructure was disaster before hurricanes. Congress to decide how much to spend.... …We cannot keep FEMA, the Military & the First Responders, who have been amazing (under the most difficult circumstances) in P.R. forever!” the Trump—the president tweeted. This comes after Trump’s visit to Puerto Rico last week, when he complained that its recovery had, quote, “thrown our budget a little out of whack.” On the island, Puerto Ricans responded with disbelief to Trump’s latest comments. CARMEN MARÍA COLÓN: [translated] Oh, god. This guy Trump is sick. He’s not well. But we’re Americans. We’re part of the nation. How is he not going to help when we need it? I think it’s bad on his part. ALFREDO COLÓN COLLAZO: [translated] Trump, I’m not in agreement with the words he uses, because I’ve always considered, since I was born, that we Puerto Ricans are part of the United States, and many of our relatives have sacrificed their lives for the United States. So, the words he uses, I don’t consider to be anything good. 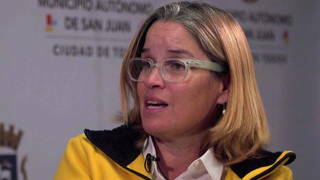 AMY GOODMAN: Meanwhile, San Juan Mayor Carmen Yulín Cruz took to Twitter to call Trump “hater-in-chief,” and said in a statement Trump is threatening to, quote, “Condemn us to a slow death of non-drinkable water, lack of food, lack of medicine.” The mayor also appealed to the United Nations, UNICEF, the world to, quote, “stand with the people of Puerto Rico and stop the genocide that will result from the lack of appropriate action of a President that just does not get it because he has been incapable of looking in our eyes and seeing the pride that burns fiercely in our hearts and souls,” unquote. Federal officials admit there’s a massive shortage of food in Puerto Rico, where 2 million people need food, but FEMA is serving just 200,000 meals a day. For more, we go to Chicago, and we’re joined by Congressman Luis Gutiérrez, Democrat of Illinois. Welcome back to Democracy Now!, Congressman Gutiérrez. REP. LUIS GUTIÉRREZ: Thank you, Amy. AMY GOODMAN: Your response to this series of tweets that the president of the United States wrote yesterday? REP. LUIS GUTIÉRREZ: It’s utterly disgraceful. People are dying on the island of Puerto Rico—dying—because there are infectious bacterias now attacking people. I don’t know how much worse it’s going to get, but I fear, Amy, it’s just going to get a lot worse. I do not see the resources arriving on the island. And I think the healthcare epidemic that is going to confront the people of Puerto Rico is going to be without precedent on the island of Puerto Rico, and maybe anywhere in the United States of America. And so, our response to the president is we’re going to stay there until we get the job done, until things are normalized, until things are regularized on the island and they can stand on their own two feet. And I am so proud of the people of Puerto Rico—although they cut those scenes out when the president tweets, those videos of the Puerto Ricans on the roads, in their homes, in their towns, cleaning up, helping one another, showing each other love and compassion, and creating a community, with very little. The food isn’t getting to a lot of places. The healthcare isn’t getting. And, Amy, for the life of me, I cannot understand why the richest, most powerful nation in the world, with the most powerful military in the world, isn’t evacuating the elderly, those that are in bed, those that are on dialysis, those that are receiving treatment for cancer—you can go down the list—those that are so vulnerable. Why aren’t we putting them in a safe place—in New York, in Chicago, in Hartford, in Lorain, Ohio—all over? In Chicago, we have our homes ready to receive our compatriots and take care of them. We have hospitals. We have schools. Why aren’t they transferring those who wish to leave the island, especially making a priority of those that are sick? I just do not understand it. And death will continue. The president liked to say, Amy, “Oh, 16 certified.” Well, we’re now over 45, and everybody knows that that’s not the number, that the undercount of those that are dying is huge, and they’re not counting those that are dying as a result of the lack of medical care, medical attention, of food and of water. There are parts of Puerto Rico that, three weeks after the hurricane, they have not put in bridges, temporary bridges, so that people can escape from where they are trapped. That’s three weeks. The most powerful military in the world, and we’re not putting people in a safe place. AMY GOODMAN: Can you respond to what President Trump said in this tweet when he said, “We cannot keep FEMA, the Military & the First Responders, who have been amazing (under the most difficult circumstances) in P.R. forever!”? AMY GOODMAN: It is three—it’s three weeks after the hurricane. REP. LUIS GUTIÉRREZ: Three weeks. AMY GOODMAN: Compare it to what the U.S. has done for Texas, for Florida, Katrina, going back to Louisiana there. REP. LUIS GUTIÉRREZ: Think about it. By this time, we had 60,000 people in New Orleans. We had hundreds of airplanes and cars and trucks and buses to get people out of harm’s way. And we stayed there for years, because we had to rebuild. And we’re still, in parts of New Jersey, rebuilding years later. We’d stay until the job gets done. I want to repeat for the viewers, there is a wall with over 50,000 names etched of those that lost their life during the Vietnam conflict. On that wall are hundreds of names of Puerto Ricans. And it seems to me just so—I can’t—I don’t know what the word is to describe it. But, wow! Here is a president of the United States who said, “I got bone spurs, but I want—so I can’t serve in the military,” and he wants to walk away from those who have given, in many cases, the greatest sacrifice you can for a country—right?—the greatest tax—the tax of your blood, of your limb, of your life. And he wants to walk away. So I understand the outrage. On the other hand, Amy, let’s remember, Puerto Rico is a colony of the United States, and they want to stay there forever. They want to own it. They want to make Puerto Rico not part of the United States, but owned by the United States. Let’s give you an example. Yesterday there was a big thing. The headlines were “Relief going to Puerto Rico.” Yeah, there was relief going to Puerto Rico: $5 [billion] loan. Why a $5 [billion] loan? Why aren’t we giving them a grant, so that they can pay their bills and keep the government open? No, what we do is we give them a loan. Now that is going to be added to the $74 billion, $5 billion more. How does that help? But remember, in that bill yesterday, what did we do? We erased $16 billion worth of debt to the National Flood Insurance. Why can’t we release some of the debt from the people of Puerto Rico, debt that was incurred because we imposed on the island of Puerto Rico the U.S. Merchant Marines, under the Jones Act, the most expensive shipping? If you add up the costs since 1920 of the imposition of the Jones Act, making us use only American-built ships with American people running the boat, you add all that up, there’s the $72 billion. So don’t tell me about what is owed. A lot is owed. The destruction of our agriculture, the destruction of our land, some of our most beautiful—Vieques and the bombing—what is that all worth, Mr. President? And he’s always putting everything kind of in an accounting machine. And you know what? You leave Puerto Rico, and that’s just another reason we should impeach you as president of the United States. Is Trump Slashing Healthcare Subsidies for the Poor to Decimate Obamacare & Cut Taxes for the Rich? NEXTIs Trump Slashing Healthcare Subsidies for the Poor to Decimate Obamacare & Cut Taxes for the Rich?